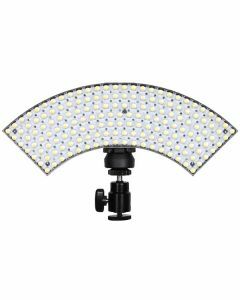 The Ledgo 160S is a camera top daylight modular LED light with a unique seamless modular design allowing you to add 3 more panels to create a complete ring light solution. The 160S has a colour temperature of 5600K and a manual dimmer control. Included with the LED is a Panasonic battery adapter, filter set, a CN-6AA battery pack and a carry case.